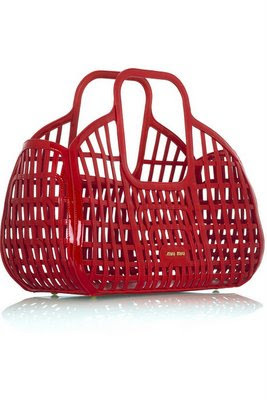 I had to post this Miu Miu Patent cutout basket bag as seen on net-a-porter. A steal at £484. 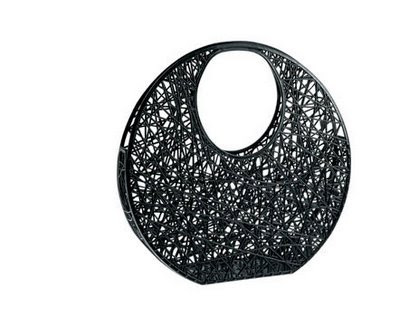 This basket inspired leather bag is just simply amazing. Personally, i would just want to walk around with it empty, but that might look a bit strange. I love it , i love it, i love it. But it might ruin it if there is something inside. 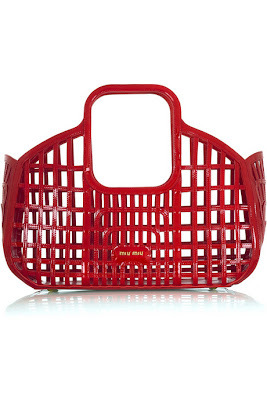 This caged structured bag reminds me of the plastic bag collaboration between the Campana brothers and Melissa shoes. This is one of just a few bags that they do. Much more unstructured but a similar light feel. The J. 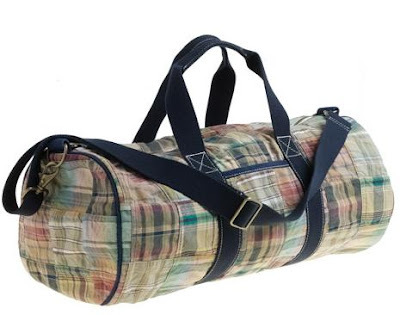 Crew Madras Duffel Bag is perfectly sized for the gym or an overnight trip and is made from an authentic yarn-dyed cotton madras from India. Patchwork is back! in many different styles and colours. This barrel bag is the perfect slouchy-ness for summer and also looks super light so when its not full it becomes a perfect floppy, slouchy shape. This is a winner bag and completes the weekender-preppy look. For me these epitomize the future the way we might have looked at it 20 years ago. 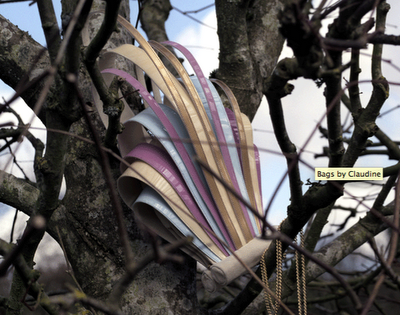 Claudine is a Central St Martins graduate and has shown at the V&A alongside Westwood and Roland Mouret. 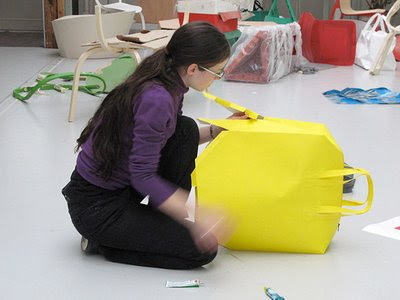 These pieces are from her AW2007 collection inspired by architecture and Eva Hesse. They are really sculptural and static and whilst i can’t imagine them being all that functional they certainly are show stopping. I think we need more fresh accessory design around. Designers who are willing to push the boundaries of convention. I am sick of bags that are made from the most expensive italian leather and that is supposed to make them special and desirable. That is why i love these bags. 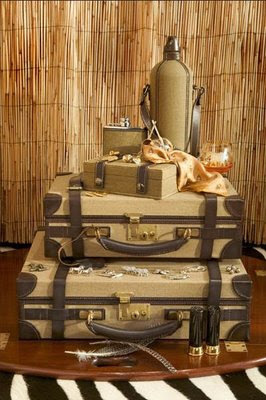 Posh luggage is back in, its all about the return of luxury. Depsite the current economic craziness, you wouldn't think that many people are travelling let alone investing in expensive and not so functional luggage, but i actually think that there is a new appreciation for classic luxury pieces. Sorry, i'm not sure where this luggage is from and who it is by, it looks like Globetrotter, and probably is, but i can't remember. The great thing about this style of boxy luggage is that you can stack them or store them on display when not in use rather than hiding them away in a back wardrobe as you would do with most modern luggage available these days. 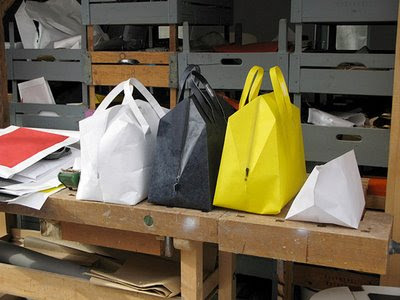 As seen on designboom, these amazing paper bags called 'Papier Bags'. They are made of DuPont™Tyvek®, a synthetic paper that is extremely light but at the same time robust but also light, waterproof, recyclable and tear proof. 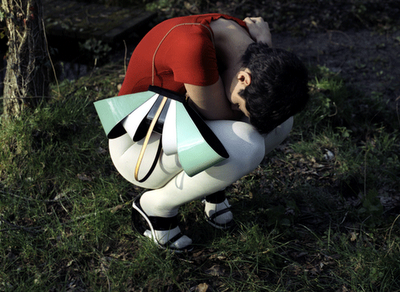 Multi-coloured bags by French accessory company Sequoia. I really like the simplicity of the colour blocking. 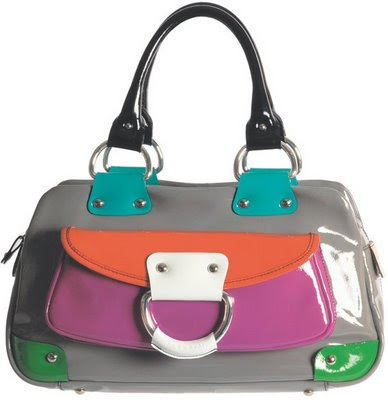 Its as you would expect colour blocking to appear but it is elegant rather than overly child-like. I picked up these images recently at the bag show Mipel held in Milan twice a year. 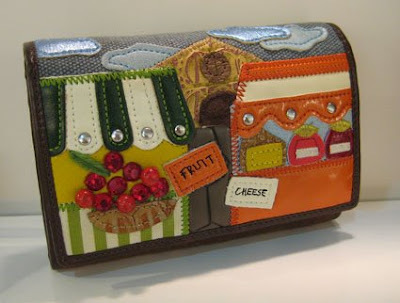 Its a great place to see lots of European bag labels under one roof. But be warned, wear your walking shoes. Even though times are grim, Mipel showed that bright colours were as important as ever. People might be wearing lots of black clothes but they still seem to be teaming their outfits with brightly coloured accessories. 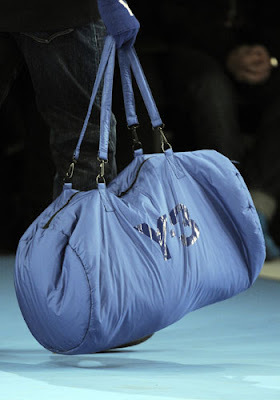 Think Louis Vuitton and Stephen Sprouse collaboration. Chanel on sale for £5.99 at Tesco! Well thats what it could look like. This crazy design reminds me of the toy packs that you get for kids at xmas from Toys R us with the kiddy versions of all the adult accessories. This is a really cute inventive idea, and i'm sure very press worthy and eye catching. I have been going through the Autumn / winter 2009 catwalks and things are looking really grim in the accessory area. 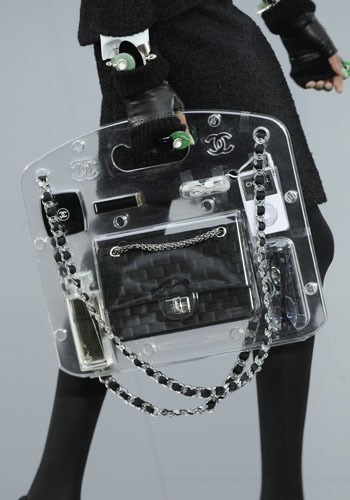 There doesn't seem to be anything interesting at all going on - except this - Chanel transparent bag, which i love. This is the pretty-in-pinnk version. 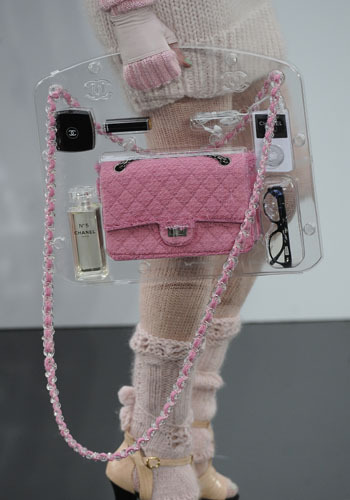 It comes packed with Chanel goodies such as the Chanel I-pod, specs, eye-shadow, Chanel 2.55 classic handbag and its all put together in a plastic transparent casing for all to admire and bound together by the signature (and often copied) Chanel leather woven chain. Karl Lagerfield gives Lily Allen a little pressie! 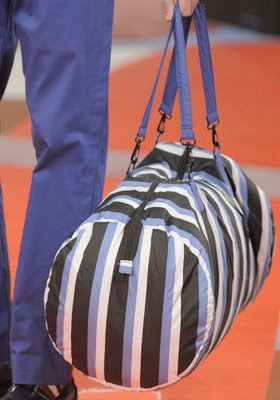 Not exactly in the spirit of credit crunch accessory design, Lily Allen has been given a gift by Karl Lagerfield. 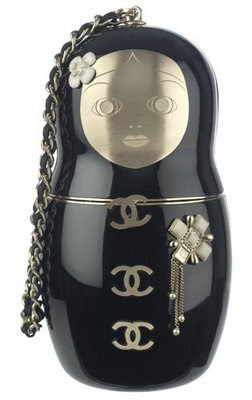 Its a purse in the shape of a babushka or Russian Doll with the signature Chanel wrist chain. You can't deny that it is a pretty little thing, every girls dream little container to stow away her girly things. Its no wonder that Lily Allen loves it, i would too! But it has to be said, these one-off / boutique 'look at me' pieces are slightly indulgent. Or maybe i'm just a little jealous? 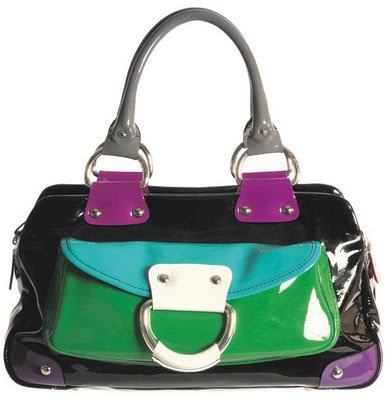 Whilst i think its cute, its not exactly a bag that suits the times. Yes, it injects a bit of fun into this gray financial landscape, but also smells slightly gimiky. What does everyone else think of this little doll? Hot off the press, i'm seeing loads of these puffy bags around. They have a definite sporty feel about them. Y-3 adidas with Yohji Yamamoto have done these ones in print and plain, i just feel like crawling into one and getting nice and cosy and warm. The slouchy barrel bag is also a really hot item for this and coming seasons! watch this space! 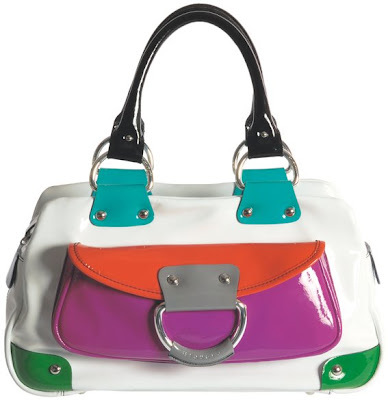 Braccialini are still going strong with their eccentric bag style. The designers at this place must have so much fun! 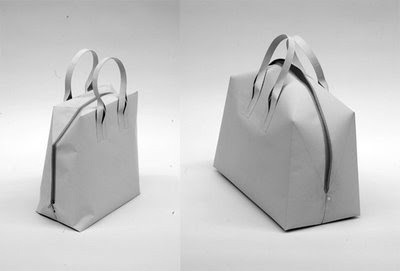 and the bag makers themselves must absolutely hate the designers. 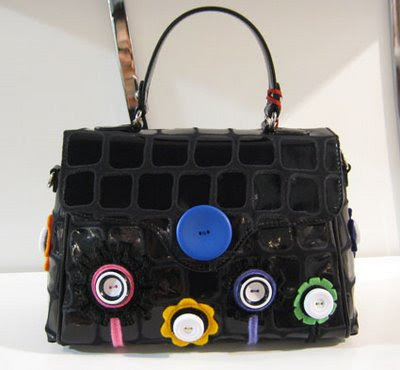 This range of bags was seen recently at Mipel bag show in milan. Its the new Autumn / winter 2009 / 10 range. 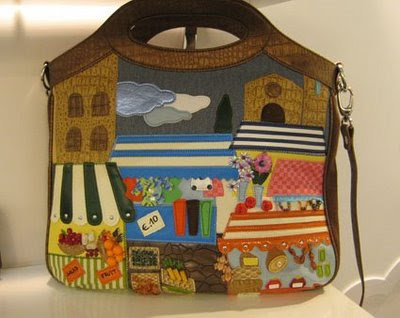 This bag above is inspired by 'postcards' which is the range of bags from Braccialini which depicts scenarios of everyday life on the front of a bag. 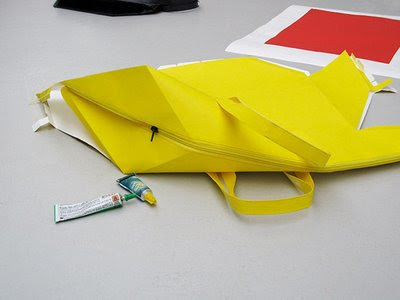 Each season they have new inspirations which guide the subject of the bag designs. The ones above look like the scene of a little saturday morning shopping trip into a small italian town on the side of a mountain. Looks like a nice place to live! 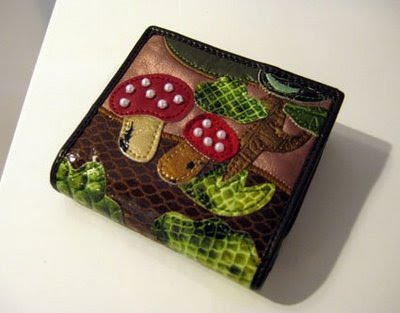 I love the literal simplicity of the designs, almost like a child's drawing come to life in luxurious leather. I would really love to own one of this pieces, I would say that they have a bit of a cult following. they really bring a little fun into fashion accessories, but i bet the price tag means that these would only be affordable to serious collectors! Buttons!!! Buttons as flowers. Cute. Not sure about the boxy construction of this one and it looks slightly juvenile but go braccialini, you never cease to surprise! 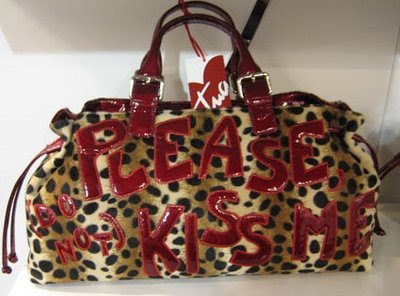 The hand-drawn style text on the bag really breaks into the 'luxury' image of the leopard skin body. Poking fun at luxury itself. Just like Stephen Sprouse has done with Louis Vuitton, i bet the guys at Braccialini have been doing it for a lot longer. 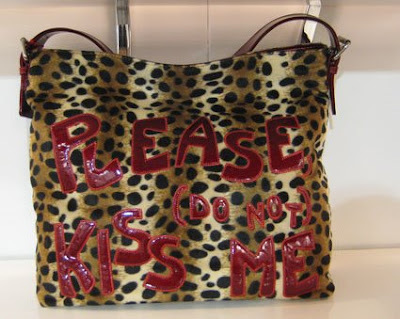 Stylistically, the bag works i think - shiny patent text layered upon textured fur is a winning combination.